San Francisco City Hall Weddings and Elopements. San Francisco City Hall is one of my favorite places to photograph. I remember the first time I walked into the Majestic San Francisco City Hall I was in Aww. It reminded me of being back in Europe. 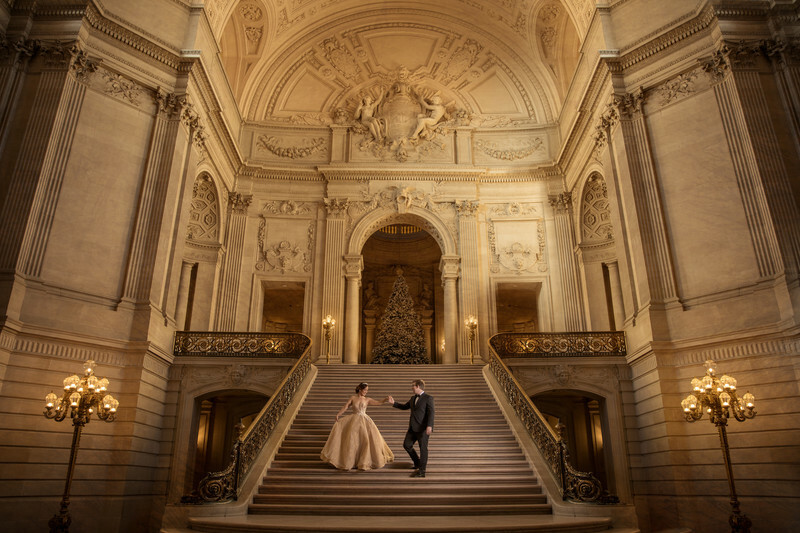 Here are some things to think about when planning your wedding or elopement for San Francisco City Hall. Wedding Ceremonies at City Hall in San Francisco are done Monday-Friday 830 am-5pm. The best time to photograph a wedding for the best possible wedding or engagement photos are done early in the morning around 830 am. There is no one on the famous steps at the San Francisco case. The busiest day to for weddings at the San Francisco city hall is on Friday's, there is a tight schedule, the slowest days are Wednesday or Thursdays. Two reservations required. One to obtain your marriage license and another one for your actual ceremony. Being voted best wedding photographer in San Francisco by Shutterfly was quite the honor. I was voted by the editors of shutterfly.com and its because of the creative and dramatic images from the San Francisco City Hall. So if you are searching for the best San Francisco City hall photographer then you have come to the right place. 2.The fee for the marriage ceremony in the Rotunda or in a private ceremony room is an additional $81. 3.You can have your wedding ceremony on the Mayor's Balcony or the Forth floor for $1002. 4.6 guests are allowed unless you book a wedding ceremony on the Mayor's Balcony. 5.There is limited amount of parking at the San Francisco wedding in a parking garage just outside of the building. 6. 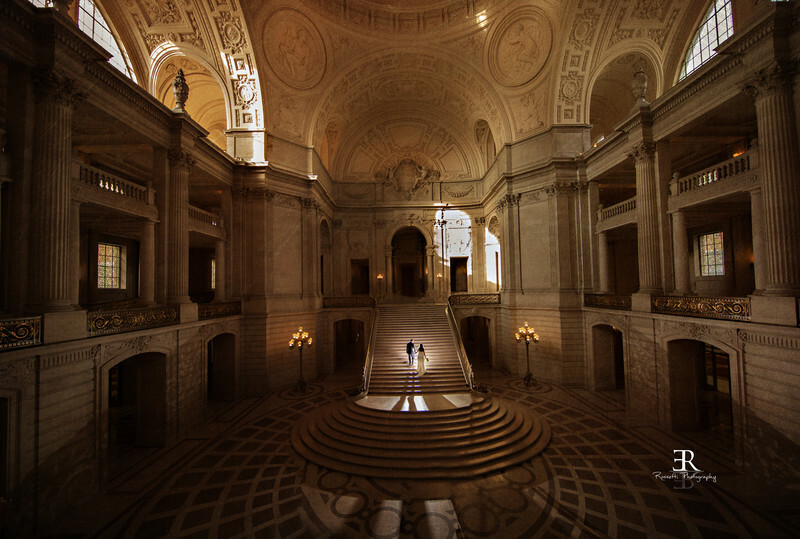 You will need a witness to get married at San Francisco City Hall, and I have been a witness to quite a few. 7. You will need a valid marriage license, legal photo ID, you dont need to be a California resident, or a US citizen, to get married in SF City Hall. 8. Expect to see a ton of couples about to get hitched while you are at city hall, don't let this stress you out. 9. 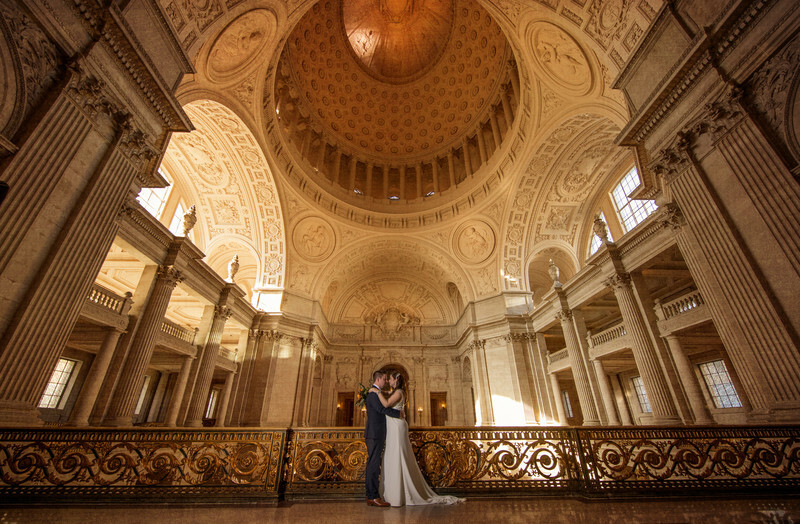 Rossetti Photography specializes in capturing creative and different wedding photographs at the San Francisco City Hall.